Preface: You deserve to know that I have a unique ability to irritate people on both sides of an issue with a single opinion. I did a post a while back on good moms who spank. I actually do not believe that spanking is in and of itself evil or that a mother who occasionally uses this as a form of discipline is actually a bad mother. I am not a fan of spanking necessarily, but the more kids I have, the more I realize how different all humans are BORN and how there probably isn't just one perfect parenting model for every child. This post, as a warning, concerns the Bible and my understanding of certain verses, so if you prefer not to delve into that, then please, don't read. Here is what I think of the other side of the spanking coin. Stand back, it is bound to offend someone. Spare the rod, spoil the child. This is a couplet often spoken in defense of the act of physically punishing a child. It is also often talked about as if this were a scripture, found in the Bible. It is not. This couplet, "Spare the rod, spoil the child," is not in the Bible. Anywhere. Really- go look. The word that people seem to get hung up on here is ROD- So, what exactly is a rod? Is it simply a stick that you should use to hit your kids with? Or is it something more? Could it have a deeper meaning that we have forgotten? "The rod and reproof give wisdom: but a child left to himself bringeth his mother to shame." The "rod" in both of these scriptures is paired with words like "chasten" and "reproof". What do these words mean exactly, and what do they have to do with sticks? "criticism for a fault : rebuke"
A rod could most certainly be referring to a simple stick. In fact in the scriptures, sheepherder's used sticks, called rods- but even those rods, when we look at them more closely were more than a simple stick. 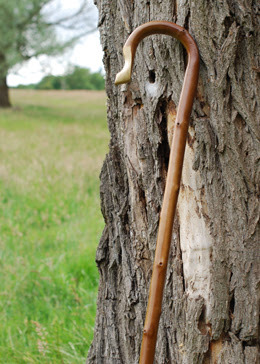 The rod that a sheepherder used was used to protect his flock. He would use his stick to beat off those animals who wished to attack his sheep. Shepherds also had a staff, sometimes referred to as a rod, which they used to guide and move their sheep to safety. As far as I know, they didn't actually use their rods to beat their sheep, but to protect and guide them. Is it possible that the common understanding of the scripture, "he that spareth the rod, hateth his son" is not really talking about hitting our children with sticks, but is in fact telling us that we MUST guide our children. Could it also be saying that if we neglect to teach, train, guide, chasten, subdue, purify, refine, and discipline our children that we are not loving them the way we should? To me these scriptures are not a license to hit children with foreign objects. Quite the contrary, they are an admonition that it is imperative to raise our children, to teach them, and to do it well. We must not be afraid to tell them if they are doing something that is wrong, even if it hurts us to correct them. Maybe we are expectred as parents to have the strength to tell our children when their behavior is inappropriate. Maybe sometimes it is more important that we teach our children correct principles than make them feel good about every choice they make. Maybe he who hateth his son is the man (or woman) who leaves them to themselves, or lets them do whatever they would like without our input, love, approval and teaching. To me the rod is much deeper than a simple wooden object. It is guidance, love, discipline, and reproof. To me this rod also refers to the rod that a sheepherder used to protect his flock- we must protect our children from those things that would harm them- not bad days and hurt feelings- but predators and evil things that could destroy them. When I understand more the language and the history behind the scriptures, they make so much more sense to me. We are expected to guide our children and teach them things that are correct. Maybe if we try harder to do this, hitting them with sticks will be less of a need. At least I hope so. Great post! I have learned through research that much of the bible isn't neccessarily to be taken literally. It has been interpreted and all we can do is research and use our common sense. Spank or don't. Lack of discipline is the problem. Discipline is a form of love that all kids want and need. I think I've reached a point where I've come to terms with the fact that people are going to hit their kids no matter what anyone else says, or the education anyone tries to share with them. Now I primarily just wish people would own up to it. I'm tired of euphemisms. Spanking is hitting, and hitting is violence. If a person can own up to that and be ok with inflicting it upon children, who am I or anyone else to say they're wrong? If someone who refers to his/herself as Christian wants to use an old testament king's words to justify it, I say go for it. Does it even matter if it flies in the face of what Jesus, the end all authority of the Christian faith, taught? Personally, I believe every human being is unique and there is no perfect parenting plan or method that will work for every child; and I believe all people, particularly children, deserve a life full of love and true discipline, and free of violence. I was thinking of Psalm 23 "Thy rod and Thy staff, they comfort me". Doesn't really sound like being hit with a stick. My favorite quote about this is from Dr. Sears..."At first glance these verses may sound pro-spanking. But you might consider a different interpretation of these teachings. "Rod" (shebet) means different things in different parts of the Bible. The Hebrew dictionary gives this word various meanings: a stick (for punishment, writing, fighting, ruling, walking, etc.). While the rod could be used for hitting, it was more frequently used for guiding wandering sheep. Shepherds didn't use the rod to beat their sheep - and children are certainly more valuable than sheep. As shepherd-author Philip Keller teaches so well in A Shepherd Looks At Psalm 23, the shepherd's rod was used to fight off prey and the staff was used to gently guide sheep along the right path. ("Your rod and your staff, they comfort me." – Psalm 23:4)." Interesing perspective. I do like the comparison to a shepherd and I agree we should guide our children. I wonder how you would interpret Proverbs 23:13-14. "Do not withold discipline from a child; if you strike him with a rod, he will not die. If you strike him with the rod, you will save his soul from Sheol." It appears these verses do indicate infliction of pain - "he will not die". But in keeping with the shepherd comparison, do you suppose the shepherd ever had to strike his sheep enough to inflict pain, perhaps to keep them from harming themselves? Of course this could look differently - in anger and done harshly - or with patience and love. I know it sounds crazy that a parent would or could "hit" (or "strike", as this verse indicates) in love. But if the parent does it, not because they're annoyed or angry, but because they are trying point the child in a different direction for their own good, I believe it can be effective. The problem is a lot of parents do it in anger and therefore it's too harsh. And of course, sometimes other methods are needed as well as every child is different. Actually, the Watchtower magazine for October is about raising Responsible Children, and it is very balanced and respectful of different parenting styles, but draws from the Bible for guiding principles. Literally, I interpret the rod as the word of God- so to me, that would mean- if you teach him the word of God, he will not die spiritually. But scriptural interpretations vary widely. I love this post. But who am I kidding? I love nearly all of your posts. Thanks for posting this. As a non-Christian it's nice to hear other Christians fighting the beat-your-children-because-you-love-them nonsense. This is defiantly a hot button issue among believers! I concur with you--all children are different, and some little ones DO need what I refer to as the "training swat." It isn't a "spank" and it doesn't even hurt, but...it does get their attention to listen to your words. With that said, many Christians feel spanking is mandated! I like "grace based parenting." Here are two verses that persuade me to think that "biblical chastisement" is, in fact, not mandated by God. Now which do you prefer? Shall I come to you with a rod of correction, or with love and in a spirit of gentleness? On top of this, if you look at the Greek and Hebrew words for "son" in all the "pro-spanking" verses, you will find that SON refers to grown BOYS. Not little children, and defiantly not nurslings!